Friends of Ned Wolf Park: What's in there!? 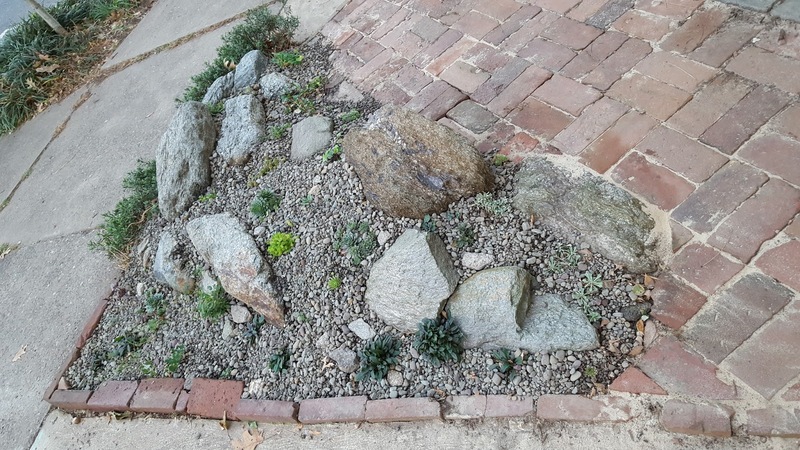 Our new rock garden located where the sidewalks meet was recently planted with around twenty different plant varieties. Depending on how these fare, we will either add or subtract to the mix - perhaps rearrange. Seven varieties of Sempervivens (commonly called Hens & Chicks) and three varieties of matt-forming Sedum (stonecrop) will provide the familiar look that succulents bring to classic rock garden design. We look forward to seeing their winter and spring foliage color which can often be distinct from that during the growing season. Another plant with evergreen character includes the perennial Iberis sempervivens, commonly called Evergreen Candytuft. This is the one plant that was saved from the 2007 planting scheme at this triangular plot. It's rich dark green leaves are overshadowed by white blossoms in late spring. We have planted several diminutive varities of plants familiar at a larger scale. These include Phlox, Thalictrim, Aquilegia, Campanula, Hypericum, and Viola, amongst others offering a variety of short-lived but colorful blooms through the season.